Wii Play: Motion with Black Wii Remote Plus is a game bundle for Wii specifically designed to highlight the new Wii standard game controller included. Featuring 12 fun multiplayer party games included with a black Wii Remote Plus game controller, this bundle is the perfect incentive for early adopters of the Wii to gain the all-in-one precision benefits of the new controller as they upgrade from their existing original Wii Remote. Twist, turn, and move like never before with 12 games that use the Wii Remote Plus controller - it's a new realm of motion-controlled fun. In each game, you'll use the controller to immerse yourself in the action. Grip it like an umbrella, then tilt it around your body to ride gusts that blow you up, down, and to the finish line of a windy race course. Use the controller like a supernatural fishing reel, hooking ghosts in a haunted house, then pulling them into a cage. Grab it like a mallet to defend your garden, smacking pests on the head or batting them into the distance. All of the games can be played in single-player and two-player modes, and four of the games can even bring in up to four players. (Additional accessories required for multiplayer mode. Sold separately.) But no matter how many people are going hands-on with the controllers, everyone in the room will get caught up in the big action of Wii Play: Motion. The Wii Remote Plus Controller is the new standard controller for the Wii gaming system, shipping with new Wii systems as well as available for individual purchase in this bundle. Like the original Wii Remote before it, this new controller utilizes a triple axis accelerometer along with a built-in optical sensor that works in conjunction with the Wii sensor bar. Together this enables the recognition of player movement as well as gives the controller the ability to act as a pointing device used in-game. In addition, the Wii Remote Plus' gyroscope technology provides on-the-fly rotational motion recognition. Once available only to Wii players who purchased the additional Wii MotionPlus accessory for the Wii Remote, it is now built into a single standard unit. * Additional accessories required. Sold separately. Twist, turn, and move like never before with 12 games that use the Wii Remote™ Plus controller. It’s a new realm of motion-controlled fun! In each game, you’ll use the controller to immerse yourself in the action! Grip it like an umbrella, then tilt it around your body to ride gusts that blow you up, down, and to the finish line of a windy race course. Use the controller like a supernatural fishing reel, hooking ghosts in a haunted house, then pulling them into a cage. Grab it like a mallet to defend your garden, smacking pests on the head or batting them into the distance. All of the games can be played in single-player and two-player modes, and four of the games can even bring in up to four players. (Additional accessories required for multiplayer mode. Sold separately.) 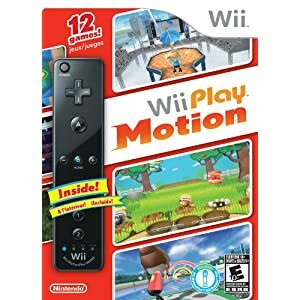 But no matter how many people are going hands-on with the controllers, everyone in the room will get caught up in the big action of Wii Play: Motion! Wii Play: Motion includes one WiiRemote ™ Plus controller. Along with the 12 games, each with challenging game play and various modes, that adds up to a powerful package in motion-controlled gaming! This game was fun and is filled with so many games for the whole family. All 12 of the games were perfect for playing wit the family. We lplayed for a while and though at first I was winning, I found that my daughter became the better competitor between the two of us. Of all of the 12 games, all were pretty fun. The one game that I had the more fun with was the ghost game. This game reminded me of ghost busters and I was having problems with figuring out the controls on this game in specific. The controls on these games are fun, but I will say that on many of the games you have to be quite precise on how you move the controller as the whole game is set up on motion, so you need to make sire that you have set up your controller to work well with the movement that is needed in the game itself. Overall though this game was a lot of fun and my daughter and I have had a ton of fun together playing this together and even though she has beat me on a number of the games I still have enjoyed the game and I know this this game will be one that we will be playing for a long time to come.